Please ask for assistance to view the reverse. Bookstein Projects is pleased to announce an exhibition of paintings by Jan Müller. This is the artist’s fourth solo show with Lori Bookstein and his first at Bookstein Projects. Executed in the most simple of shapes, Müller’s flowers could be mistaken for a vessel of lollipops. The blossoms are swiftly painted rounds of even color: fuchsia, red-orange, canary yellow and occasionally a soft blue. The round balls sit atop evenly-spaced stems which are arranged in either an erect, fan-like pattern or, more distinctly, limply drooping over the vessel which holds them. Occasionally, all of this sits on a tabletop, but more often, the arrangement floats against an abstract colorfield consisting of murky greys and browns blended with areas of vivid primary color. Jan Müller was born in Hamburg, Germany in 1922. His father was a political activist who fled from Hitler in the 1930s, emigrating with his family to the U.S. in 1941. 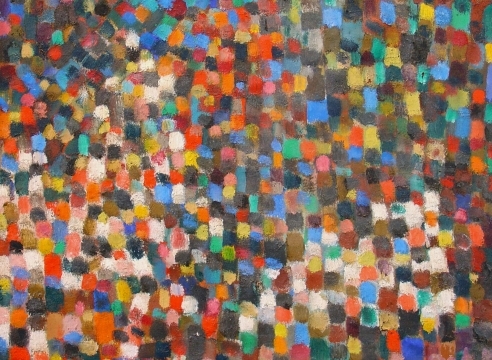 Müller studied painting under Hans Hofmann from 1945-50. In 1954, Müller underwent heart surgery during which a plastic pacemaker was implanted. This constant reminder of the passage of time is perhaps, in part, responsible both for the fury with which he painted until his death in 1958 and the urgency with which he made the radical and courageous shift from abstraction to figuration. Jan Müller’s work has been included in exhibitions at the Whitney Museum, the Museum of Modern Art, The Jewish Museum, and the 1962 Venice Biennale among others. The artist regularly showed with the Hansa gallery, of which he was a founding member, until his untimely death at the age of thirty-five. From October 24, 2015 to April 3, 2016, Jan Müller’s monumental painting, Faust, I, was the centerpiece of Soldier, Spectre, Shaman: The Figure and the Second World War at the Museum of Modern Art, New York. Also on view is a sculpture, Divided Vases: Tea and Garden View, by the late Betty Woodman. This sculpture was executed in 2006, the same year she received a retrospective at the Metropolitan Museum of Art – she was the first living woman to ever do so. This diptych is comprised of two vessels with attached “wings” made from ceramic slabs, which are adorned with garden views in the spirit of Matisse. Meant to be viewed in the round, her sculpture defies characterization as craft and offers the viewer the unexpected opportunity to view not front and back, but front and front. Jan Müller: Flowers will be on view from January 17 – February 23, 2019. A reception will be held on Thursday, January 17th from 6:00-8:00pm. Gallery hours are Tuesday through Saturday, 11:00 am to 6:00 pm. For additional information and/or visual materials, please contact the gallery at (212) 750-0949 or by email at info@booksteinprojects.com. [i] Messer, Thomas M., "Jan Müller's Art,"Jan Müller: 1922-1958, New York: The Solomon R. Guggenheim Museum, 1962.